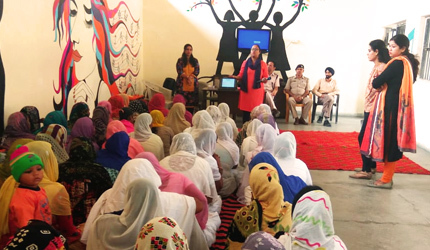 Training with Faridabad District Jail inmates on women health. The program was conducted with Unicharm India to promote their CSR philosophy of “Nola & Dola” among female inmates. Initiating Phase-II of Reproductive Health Care Programme with the support of Spark Minda Foundation in rural villages of Tamil Naidu, Uttar Pradesh, Maharashtra, Uttarakhand. For the past 4 years GlobalHunt Foundation with the support of Unicharm India have been able to break the silence of more than 5000 on the subject of menstrual hygiene. Covering villages, schools, panchayats and angwandi centres in states of Andhra Pradesh, Bihar, Rajasthan and Madhya Pradesh. GHF has been organizing employee mentorship programmes in various government schools to provide extra learning opportunities to students. Safe drinking water is the right of every human. Promoting the same by in Chennai school by providing RO plant with the support of DXC Technology. GlobalHunt Foundation has been supporting various government schools of India to provide quality education. One such school recently renovated school of Uttar Pradesh. GHF & Seagate Technologies inaugurated STEM Lab in government school of Bangalore which will support experimental learning among students. DLF Foundation and GlobalHunt Foundation jointly organizes “Rethinking Sustainability Agenda: Generating Innovative Projects & Partnerships”. GlobalHunt Foundation (GHF) is a Section 8 registered not-for profit organization working towards implementing diverse CSR programmes in various thematic clusters as per The Schedule VII, of the Companies Act, 2013. GlobalHunt Foundation (registered as Section 8 under The Companies Act, 1956) which works with businesses, government, social organizations, academias’, institutions, funders, innovators etc. who believe in developing and implementing sustainable models that are relevant to overcome the disparity of society. We assist in building models of interventions which bridge the gap between inequality to equality, unsustainable to sustainable, impractical to practical, impossible to possible. We are a Pan India based organization having our offices in 9 metro cities.